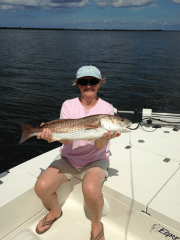 Now is the time for all fishermen who like to fish the back country waters of Sanibel, Captiva and Fort Myers area to hire a charter fishing guide and enjoy some nice fishing. Even though the record rainfall has turned the water into a Starbucks coffee look, the fish can be found in waters that they are comfortable with and they are hungry. 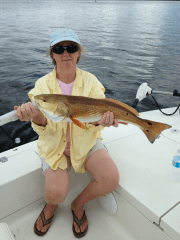 The Trout bite has increased but the Redfish bite is what I’m talking about. 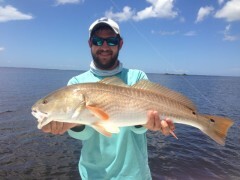 I’ve seen more schools of Redfish this year than many years past. Some schools seem to like the incoming and some like the outgoing and we’ve even had good bites on slack tides in some areas. We’re using lures, DOA Air Head, DOA shrimp, top-water plugs, and spoons. Live bait always seems to work but sometimes the lures seem the best thing to use. We’ve been fishing these fish for about a month now and hope to fish them into November. Give me a call, lets set up a day to go and give it a try!